After the downing of Metrojet Flight 9268 over Egypt's Sinai Peninsula Saturday, prominent airlines from around the globe have decided to stop flying over the area. Officials from large European and Middle Eastern airlines have said they will avoid the Northern Sinai section of Egyptian airspace while the investigation of the crash is underway. However, some airlines are choosing to continue flights as normal. The reluctance to follow the Russian jet's flight pattern stems from one of the theories into the Airbus A321's "midair disintegration." The passenger plane carrying 224 passengers and crew members was traveling from an Egyptian resort city called Sharm el-Sheikh to St. Petersburg. It had reached 33,000 feet about 20 minutes after take-off before suddenly plunging 6,000 feet. Twenty seconds later, the plane lost radar contact and then crashed into the ground. 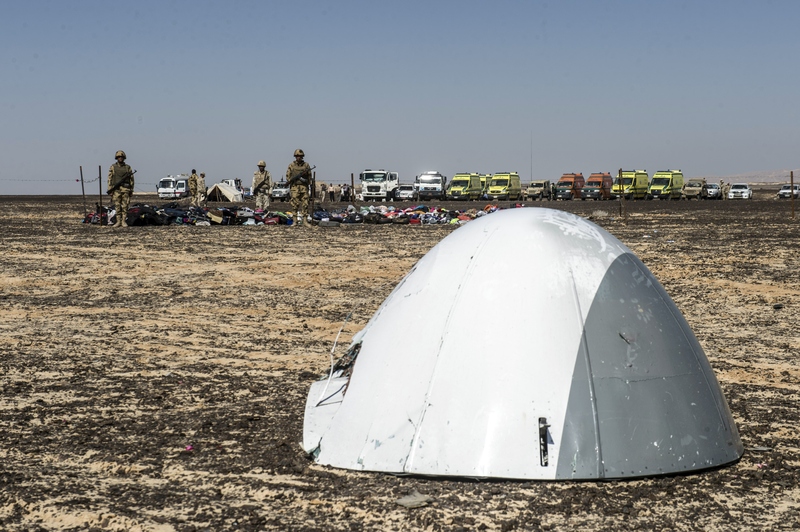 The terrorist group ISIS claimed responsibility for the crash Saturday on Twitter, but Egyptian and Russian officials said they doubted the incident was a terrorist act. However, it could explain why the plane didn't hit the ground intact. The New York Times reported on Sunday that officials reported a spread-out debris field of more than 7.7 square miles, which indicated the plane came apart midair, a rare occurrence. If ISIS militants were to blame, any passenger jet over the area could be at risk of being shot down. Lufthansa and Air France-KLM said Saturday they will stop flying over the area until the ISIS claim is investigated. The largest airline in the region, Emirates, has said it will reroute flights around the peninsula, as will its subsidiary flydubai, Air Arabia, and Qatar Airways. Qatar Airways said its decision was made out of an "abundance of caution." The other big Gulf carrier, Etihad, based in Abu Dhabi, has said it will continue flights over Sinai because no evidence has suggested "any ulterior motive in the tragic crash." It will however avoid specific areas of the peninsula based on the advice of Egyptian officials. After the downing of Malaysia Airlines MH17 over Eastern Ukraine in July 2014, the airline came under scrutiny for flying over the area given the fighting between the Ukrainian government and Russian-backed rebels, both of whom have denied responsibility for shooting down the jet. Some airlines, particularly British Airways and Air France, were already rerouting around this conflict zone prior to the crash. In the report released this October, the Dutch Safety Board says Ukraine had reasons to close its airspace sooner given prior incidents of planes and helicopters being shot down. In Egypt's case, ISIS fighters and other militants in the area are not thought to have the capability to bring down a jet at cruising altitude. The jet was at 33,000 feet, and there are very few surface-to-air missiles capable of reaching that height. According to Egyptian military officials, ISIS fighters have some shoulder-launched missiles that could bring down a plane at a lower altitude, but nothing as advanced as what was used in Ukraine and would be necessary in this case. A former chairman of the National Transportation Safety Board Mark Rosenker told The New York Times that it could also be a more conventional act of terrorism, for example a bomb in the luggage hold. Both of the plane's black boxes were retrieved, and examination of the recorders should quickly rule out some possibilities. If there was a midair explosion, it should be audible on the cockpit voice recorder, Rosenker said. Given the high stakes for both Egypt and Russia, unless evidence points to a bomb or missile, we can expect terrorism to be ruled out quickly — whether that leads airlines to fly over the area once again is another question.